Teach For America Idaho’s footprint has grown steadily since its 2015 launch — and the nonprofit is looking to expand further. That means looking beyond the Treasure Valley, where TFA teachers now serve about 3,000 students. “It is something we are very interested in exploring,” TFA Idaho Executive Director Tony Ashton told the House Education Committee Monday morning. A national program founded in 1990, TFA recruits recent college graduates to fill teaching jobs in high-poverty and underserved K-12 schools. TFA corps members receive five weeks of intensive training before they are assigned to classrooms. TFA has 40 first- and second-year teachers in seven Southwest Idaho communities, from Garden City to Weiser and Payette. That’s up from 12 teachers in TFA’s inaugural year. 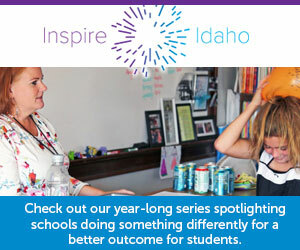 In all, 38 percent of TFA’s Idaho teachers fill special education jobs, and 30 percent fill math and science positions. Christine Ketterling of the Homedale School District vouched for her district’s TFA experience. Before Homedale partnered with TFA, the Owyhee County district filled math teaching jobs the day before the start of the school year, for two successive years. “(TFA) has been a great resource,” said Ketterling, Homedale’s federal programs and curriculum director. TFA is starting to track some Idaho retention numbers. The retention rate is at 100 percent for first- and second-year corps members, but decreases for TFA alums. After two years, about two-thirds of alums stay in teaching, and about half stay in the Idaho district where they started their teaching assignment, Ashton said. Nationally, TFA says about two-thirds of its alumni work full-time in education, and 85 percent work in education or other careers serving low-income communities. Retired Idaho teacher and former state superintendent’s candidate Cindy Wilson is stepping down from the State Board of Correction. The Meridian Democrat had served on the three-member board since 2015. Under state law, Little cannot appoint a Republican to Wilson’s seat on the board. Wilson ran against GOP state superintendent Sherri Ybarra last fall, losing by about 17,000 votes out of 594,000 ballots cast. Gov. Brad Little will propose a bill to increase Idaho’s minimum teacher salary to $40,000 this session. Greg Wilson, Little’s senior policy adviser focusing on education, told the Senate Education Committee on Monday that Little’s staff is drafting a bill. If passed into law — and funded by the Joint Finance-Appropriations Committee — the bill would enact one of Little’s top K-12 initiatives. Last month, Little used his State of the State address and budget request to push for a fifth year of salary increases under the 2015 career ladder law. Little called for spending another $11.2 million to raise beginning teacher salaries to $40,000. The salary issue is one of several decisions JFAC and the Legislature will consider in the coming weeks. Superintendent of Public Instruction Sherri Ybarra has called for increasing teacher salaries at an even higher level than Little. In her budget request, Ybarra called for spending $27.8 million, beyond the career ladder level, to increase salaries for more experienced educators. That request would raise pay levels for educators at the top “professional” rung of the career ladder from $50,000 to $52,000 in 2019-20, Legislative Services Office budget analyst Robyn Lockett said. A bill to exempt charter schools from highway district impact fees made its debut Monday. With little discussion, the House Local Government Committee printed the bill. The impetus for the bill is a situation facing Meridian’s Compass Public Charter School. The school is facing a $200,000 bill for Ada County Highway District impact fees on a new building, said Rep. John Vander Woude, R-Nampa, the bill’s sponsor. Traditional public schools are exempt from impact fees. Supporters introduced a similar bill last week. The rewrite contains an “emergency clause.” That means the bill would go into effect immediately upon passage. The bill was introduced unanimously, and would likely come back to the committee for a full hearing at a later date. A charter school group is ripping a newly released consultant’s report that criticized the performance of Idaho’s virtual charter schools. The report from Stanford University’s Center for Research on Education Outcomes said students in brick-and-mortar charter schools outperform their peers, particularly in rural Idaho. But the report also singled out virtual charter schools — and specifically, their students’ performance on math tests. In a news release, the coalition cited increased graduation rates for the Idaho Virtual Academy, the state’s largest charter school. The graduation rate has improved from 21 percent in 2014 to 67 percent in 2018 — although that remains well below the current statewide rate of 80 percent. The House Health and Welfare Committee declined to introduce a bill dealing with exemptions from Idaho’s immunization guidelines. Instead, the committee asked for clarification and returned the bill to its sponsor, Rep. Priscilla Giddings, R-White Bird. Last month, Giddings introduced a different concurrent resolution attempting to nullify immunization guidelines for school children. Giddings went around the traditional committee process and introduced that resolution as a personal bill. House leadership referred Giddings’ resolution to the House Ways and Means Committee, where personal bills are often sent to die. So far, Giddings’ immunizations resolution has not received a hearing or advanced in any way.